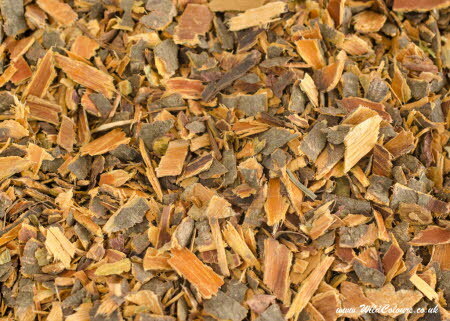 Alder Buckthorn bark is a useful dye, as it can be used without a mordant. You will get mustard yellows on wool by simmering, and brick or cinnamon red by fermentation. Navigate to "Red Dyes" > "Buckthorn" to read more about its biology and for instructions on how to dye with buckthorn bark. The buckthorn bark chips are weighed and sealed in a polythene bag. The bag is then labelled, placed in a padded envelope and posted to you First Class.